Backed by a team of qualified professionals, we are engaged in providing our clients Carton Wrapping Machine. This machine is mainly used for packaging cartons with stretch film and can be operated along or with the production line. 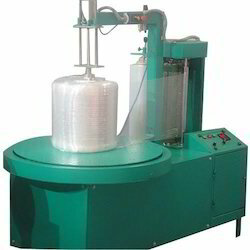 Moreover, this machine is accessible on varied specifications according to the needs of customers. Wrapping provides protection from Pilferage, Water / Moisture, Dust. Cost of Straps can also be saved. Looking for Carton Wrapping Machine ?